This news item was posted in Pakistani News, Videos category and has 0 Comments so far . 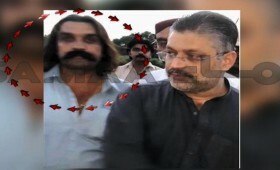 Hyderabad’s suspended SSP Pir Farid Jan Sarhindi unleashed a battery of charge against Sharjeel Meomon. Watch Arif Mehmood’s report to know what did he say.